With the end of summer comes the joy of sitting outside with family and friends on a warm night. Imagine quiet conversation on a patio or porch in the light of flickering candles. 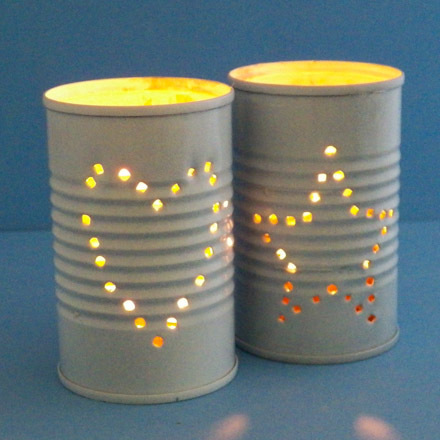 These simple candle holder luminaries are made from recycled cans and are great as a family or group project. 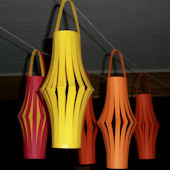 Related craft: For quick-to-make decorations, see the Chinese Paper Lanterns craft project. For each candle holder, you will need a small- to medium-size can, like an evaporated milk or small tomato sauce can. Remove the label and any adhesive. Wash and dry the can thoroughly. If you are doing this craft with a group, gather all the required materials and do the following two steps ahead of time. Younger children will require close supervision and adult help when punching the holes. 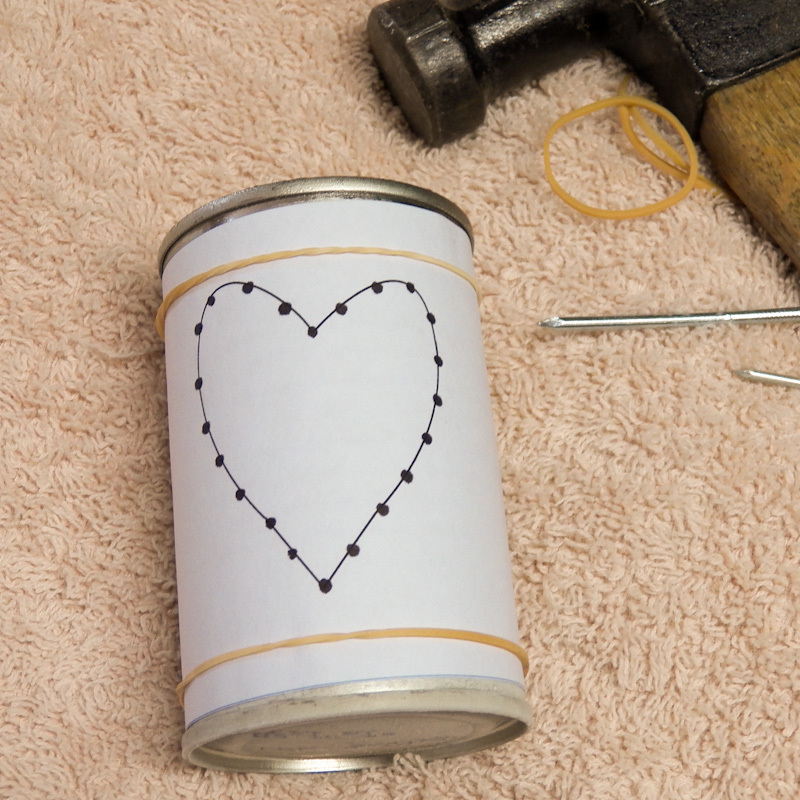 You will create the can's punched design on paper first. Measure the height of the can and around the can. Cut a rectangle from white paper in the same dimensions. Repeat for each can. 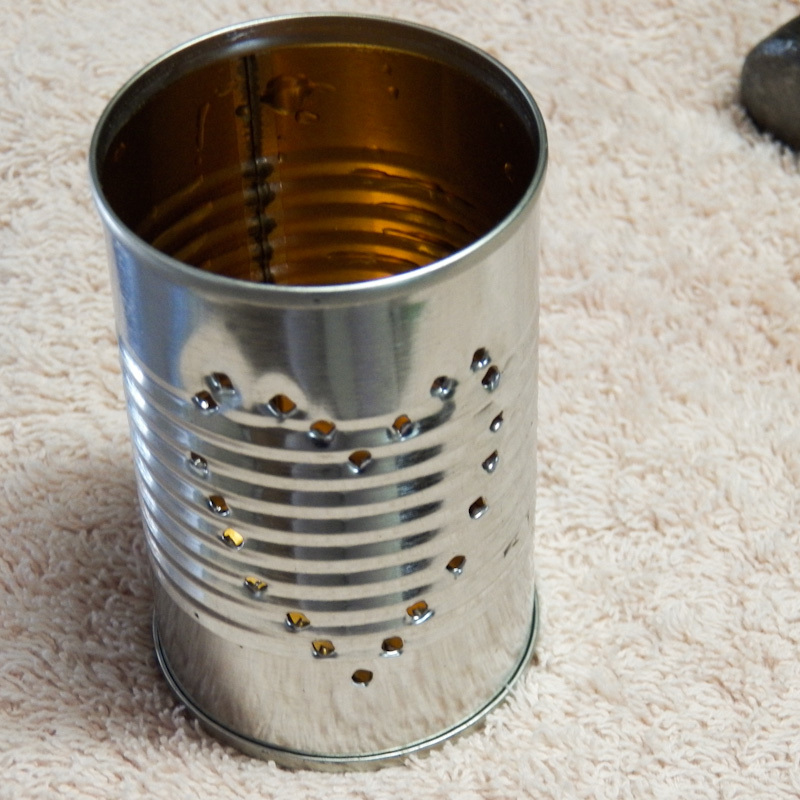 Fill each can with water to near the top. Place the cans into the freezer until the water is solid ice. The ice will prevent the can from becoming misshaped when you make the punched holes. With a pencil or pen, draw simple designs on the rectangle of white paper. Make an overall design or a design just for the front of the can. 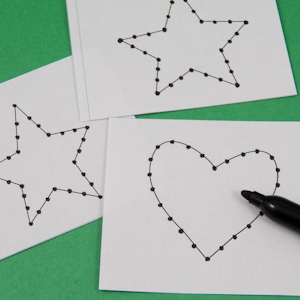 Simple line drawings are best, like stars, hearts, crosses, and snowflakes. Be sure the design is a bit smaller than the can and that there is at least a ¼" margin at the top and a ½" margin at the bottom. 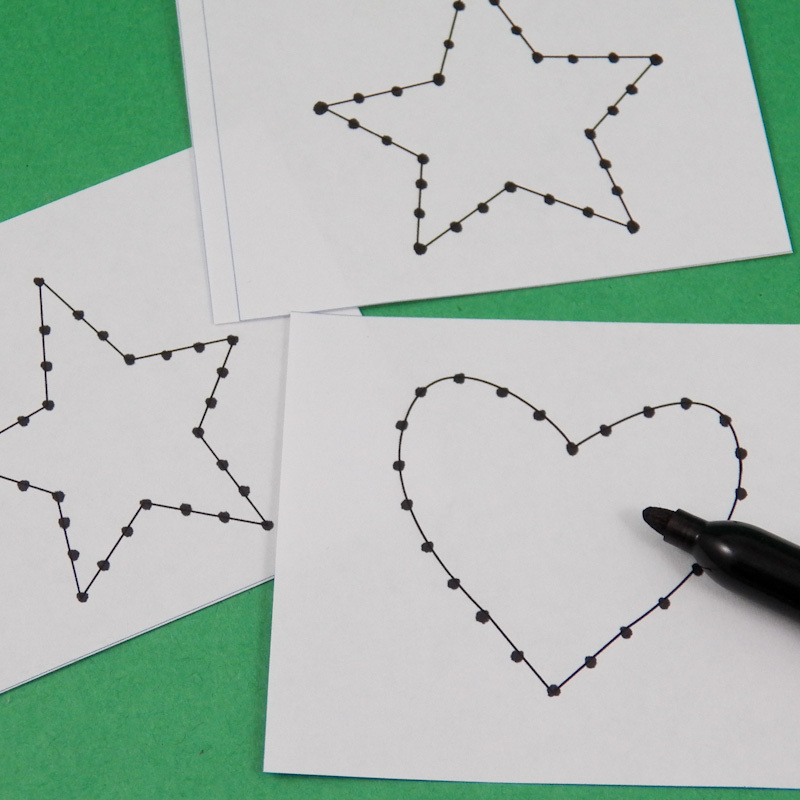 Once you are satisfied with your design, use the black permanent marker to make dots along the design outline. These dots mark where you will punch holes and should be evenly spaced. Remove the can from the freezer and wipe off any frost. Wrap the white paper around the can and hold it in place with two or three rubber bands. Fold an old towel so that there are are least four layers and lay your can on the towel. Punch holes in the can with a hammer and a nail following the black dots. Keep rotating the can as you move along the line of dots so that the dot you are punching is always facing up. Tip: Younger children will need help making the holes. You could let the child rotate the can while an adult makes the holes with the hammer and nail. 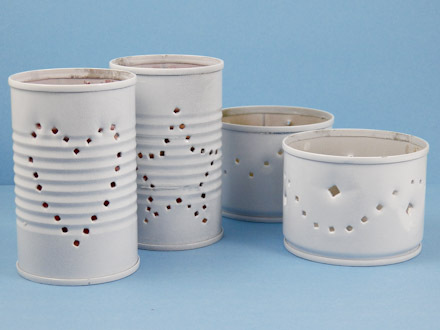 After all the holes are made, remove the paper from the can. Run the can under warm water to melt the ice. Dry the can well. Careful! The inside of the can has sharp edges! Spread lots of newspapers in a well-ventilated area. Spray paint the can and apply a second coat, if needed. When the paint is dry, use a nail to open the holes closed by the paint. White and colored paints work well. Pour ½" or so of sand in the bottom of each candle holder and set a candle or tea light in it. 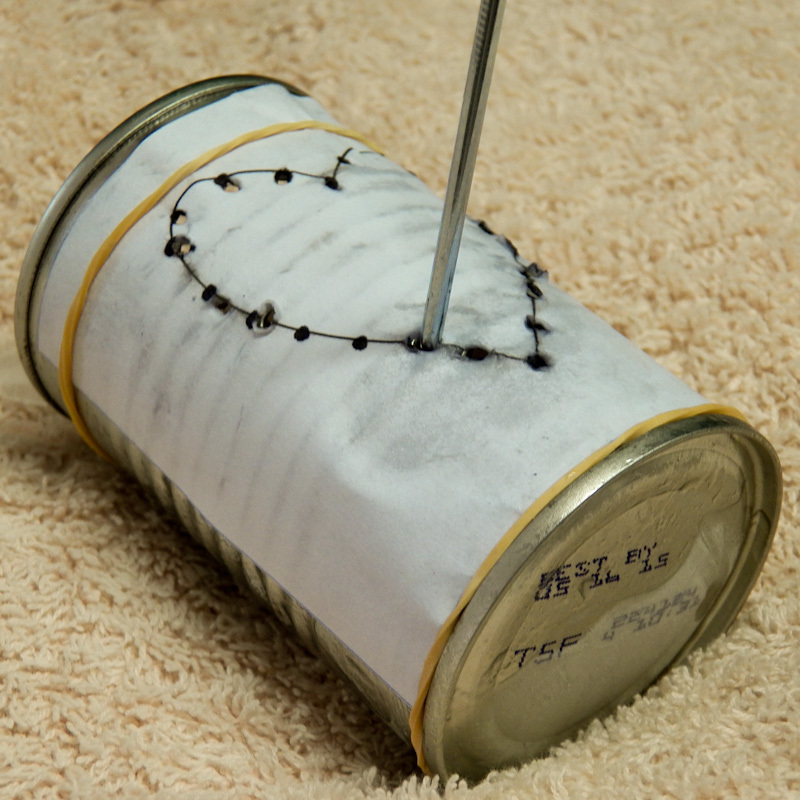 Put the completed candle holder on concrete or another heat-tolerant surface. Be careful not to touch the candle holder when the candle is burning—the can will be hot. The inside of the candle holder has sharp edges, so to light the candle, you will need a long match or grill lighter. You can also use a bamboo skewer lit with a match to reach down inside the candle holder. That's it! 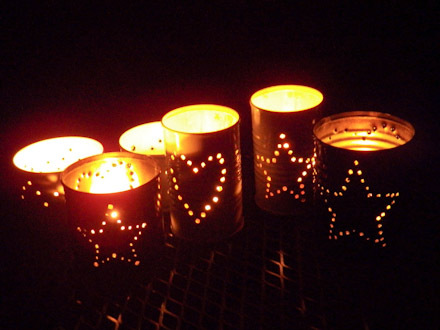 Your candle holder luminaries are complete! 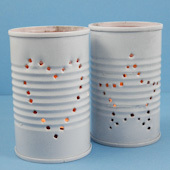 Tip: The yellow flame of the candle glows through the punched holes. 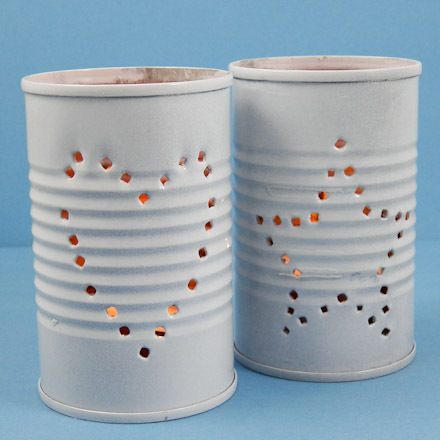 Tip: Just about any small- to medium-size tin can makes a nice candle holder. Related craft: The light from your candle holders will reflect off the ceiling. 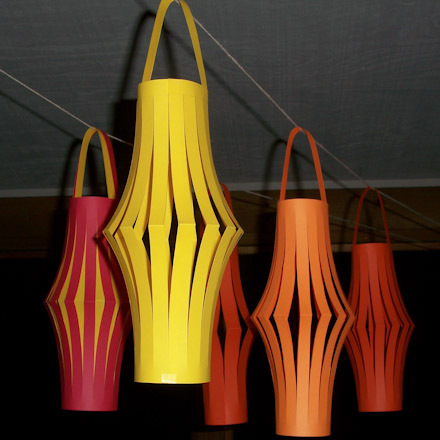 Make several Chinese Paper Lanterns to catch that light.